Import growth also defied forecasts for a slowdown, suggesting Beijing's growth-boosting measures to support the cooling economy may be slowly starting to make themselves felt. The upbeat trade readings from China offer good news for both those worried about global demand and for the country's policymakers after the economy logged its weakest growth since the global financial crisis in the third quarter. 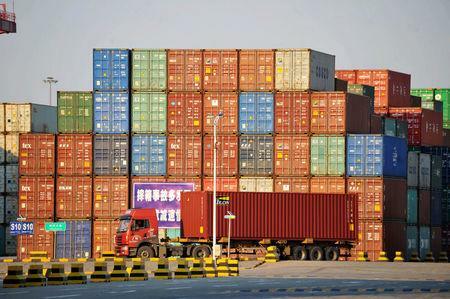 China's exports rose 15.6 percent last month from a year earlier, customs data showed on Thursday, picking up from September's 14.5 percent and beating analysts' forecasts for a modest slowdown to 11 percent. "The strong export growth in October was buoyed by front-loading activities by exporters...," said Iris Pang, Greater China Economist at ING in Hong Kong, noting the month is traditionally quieter due to long holidays. "We expect exports to remain strong toward the end of the year as businesses are afraid of a failure in the Trump-Xi meeting, which could lead to broader tariffs on more Chinese goods from the U.S.," Pang said. Despite several rounds of U.S. duties this year, China's exports have been surprisingly resilient as firms ramped up shipments before even tougher measures went into effect. Container ship rates from China to the U.S. West Coast remain near record highs, suggesting shipments will remain solid well into November and possibly early December. China's exports to the U.S. rose 13.2 percent from a year earlier in October. In another positive sign, China's exports by volume also showed solid growth, according to Oxford Economics, which estimated they rose "an impressive" 9.9 percent. But analysts say robust export readings won't last much longer, noting Chinese factory surveys have been showing contracting export orders for months. For the first 10 months of the year, China's surplus with the United States, its largest export market, totaled $258.15 billion, widening sharply from $222.98 billion in the same period last year. For trade with all countries, China's surplus was around $34 billion for October, compared with forecasts of $35 billion and September's $31.69 billion. While China's exports are expected to falter soon, its imports, especially commodities, could remain strong for months to come as Beijing rolls out more measures such as infrastructure spending to boost domestic demand, economists at ANZ said. Imports for October quickened to 21.4 percent from 14.3 percent in September, beating analysts' forecasts for a slight cooling to 14 percent. China's crude oil imports in October rose to all-time high as private refiners rushed to stock up ahead of winter, while demand for copper and iron ore was also solid though down from September levels. "Import growth also overshot expectations quite a lot. Import growth actually reflects some front-loading in China as well - buying before Chinese tariffs come into effect," Chi Lo, greater China economist at BNP Paribas, told Reuters. "More importantly, it also reflects some of Beijing's promise to buy more - as a way to help soothe the trade conflict with the U.S."